Rob Groves has never been one to duck a challenge. Formerly an avid cyclist, bodybuilder and health club owner, his life changed 10 years ago in an accident that caused a slipped disc to crush his spinal cord, leaving him paralysed from the waist down. 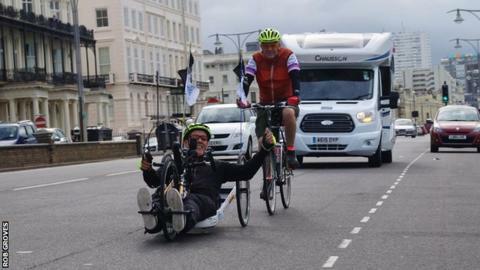 Undeterred, the 61-year-old from Crawley in East Sussex switched to hand-cycling and has since dedicated himself to endurance challenges to raise money and awareness for spinal injuries and other causes close to his heart. "Since the accident, I chose to fight preconceived ideas of what was possible for someone who could feel nothing below their waist," he says. "I've been determined to raise money to help others, especially those who may go through something as I did." He has previously undertaken a 24-hour non-stop endurance race and cycled 600 miles from Scotland to London in five days. Now he is preparing for his toughest challenge yet - a 2,500-mile journey around the coast of England and Wales, aiming to inspire disabled youngsters and also highlight the issues of pollution and climate change affecting our seas and coastline. Rob will start his journey in Brighton on Sunday, 2 July - travelling clockwise around the coast - and finish in London on Friday, 28 July. "I feel more prepared physically and mentally than I was for those previous events," he says. "Training for this has been the hardest thing I have ever put my body through. "I am excited and nervous at the same time. Having the right mental state is important all the time, to get the most out of every hour and every day." Rob will visit schools en route and hopes to inspire disabled children by showing what a hand-cyclist can do. He will also speak about the effects of pollution and climate change on our seas and coastline. You can keep up with Rob's progress with his regular updates on social media and find out more about his itinerary and goals on the Coastline Challenge webpage. If you want to get involved in hand-cycling or explore other cycling adaptations, check out the 'Inclusive' section in our Get Inspired guide to cycling.